I must say I’m not proud, but I did it. Our work lunchroom is a dim place filled with bright people. It holds one long table and 3 round ones. For a lunchtime of 200 people. Some time ago our company decided to do away with the one push-the-button-and-watch-the-food-go-round-and-round vending machine, and swept in with the newest in small company vending machines — the gas station concept. You know — big refrigerated cases all with full length clear glass doors. Two of them are full of beverages, everything from frappucinos to soda to power drinks. One is full of frozen delights like ice cream and Lean Cuisines, and the other with sandwiches, chocolate milk, and wraps. I swore I would never feed the new cooler monster. It is commercialism at its best…you can even put money in the system and it keeps track of all your purchases for you. So after the first painful deposit, you can scan away, not feeling like you’re getting robbed at every purchase. I usually bring leftovers, but this morning I was late and sleepy and trying to get out before more snow came. Well, today I ate my lunch sandwich for breakfast and my accompanying crackers for morning break. So it was either skip lunch (never! ), drive to McD’s (way too cold out), or try the cooler monsters. I looked around, vowing to be conservative if I did buy anything. Eyeballing delights more imagined than real (I know what vending machine food tastes like), I put my little debit card in and came away with a burrito wrap for $3.50. Don’t tell me this old bird is changing! The burrito was too spicy, so I couldn’t eat it all. But did you hear that? The burrito was too spicy! Most vending oddities are bland and dry and you have to squint to see the lunchmeat. I still believe it’s just another corporation making off with three of my hard-earned dollars. The youngsters of the department seem to hang around the vending coolers a lot around lunch time…the graphic artists and coordinators and even directors seem to return again and again, feeling the few dollars missing from their wallet are worth far more than eating Beef and Rice-a-Roni again. And again. And they seem to be okay with it. So why not me? There has to be something to glass door refrigerated food. I mean, there’s cameras all over, so it’s not like you can slip out a box of Lean Cuisine under your sweater. And there will be times that I’ll be shaking for a bottle of Coke and not have a penny in my wallet. I don’t know when I’ll hit the vending machine complex again — it still seems a little high priced for my working woman budget. But this shows me that every now and then I can be fooled, and good things can come out of vending machines. haha – a vending machine that dispenses bloody marys – you should go to Japan – vending machines on every corner and train station with all sorts of delights from hot coffee to ice cold beer!! ha. ha. Those might make getting up and going to work every day…worth it. 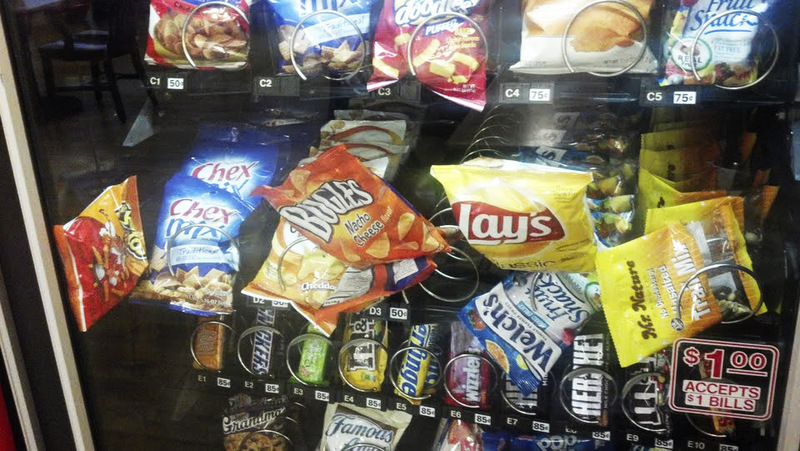 The old rotating vending machine….ahhh the nightmares of those when it would rotate around and almost but not quite release my selection…..more than once I used my best body slam wrestling move on those…. Ah yes! Me too! It never quite stopped directly at your choice. At least I can grab a coke in one movement now! Ha, I love this. We used to call the old rotating vending machine ‘The wheel of death’! Ha! Thsts what the grandbaby and hid grandpa call the spinning wheel on the computer screen!